Listen to this track by Steely Dan piano man and pop sophisticate Donald Fagen. It’s “I.G.Y”, a hit for him outside of the Steely Dan catalog, featured on his first solo LP, The Nightfly in 1982. The album isn’t too far afield from what Fagen had done with The Dan; a jazzy kind of soft-rock with a lot of lyrical irony. But, Fagen’s album was something of a concept record, the concept in question being the optimism of growing up in the 1950s and early 60s. And the key tune on the album which illustrates this best is this radio hit; ‘I.G.Y’. To me, what makes the themes in the tune interesting is that the kind of optimism Fagen is talking about in the song was not too far off from the attitudes in the early ’80s when the song was released. Specifically, the idea that technology can save us by helping us to create a golden age is prominent – “what a beautiful world this will be/what a glorious time to be free”. Yet both eras shared the spectre of a third world war, beneath a veneer of universal contentment. This puts a bit of a darker spin on things, and underscores a kind of cultural self-delusion that puts our destiny in the hands of autonomous technology; a just machine to make big decisions/programmed by fellows with compassion and vision. Beneath this happy go-lucky exterior lies a sort of technological fascism that seems like an ideal means of eradicating social ills, but is ultimately dehumanizing. Pretty heady stuff for a radio single, huh? The title I.G.Y is a reference to the International Geophysical Year (aka 1957-58) which was a scientific collective organized to observe geophysical phenomena around the globe. A faith in science as a means to shape our collective destiny was a characteristic that would mark the time. The science fiction of the pulp magazines and the beginnings of the Mercury space program around this time helped to fuel the fires of imagination and vision, and it’s that which Fagen is exploring here. By 1982 he had the benefit of hindsight. And so the lyrics of the tune which paint a bright, worry-free future as envisioned from the mind of someone in the ’50s give the song a sort of melancholic, nostalgic air. This ultimately becomes a song about false hopes. 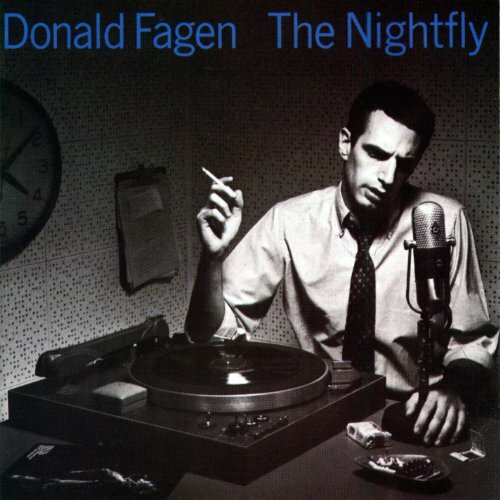 For more information about Donald Fagen, be sure to check out Donald Fagen’s Facebook page, where announcements of all kinds are made about his artistic movements. Great song! And great album! The title track and New Frontier are favorites. Regarding I.G.Y., I love the line about decisions being made by machines with compassion and vision. It’s a great line, which might sound like a breezy, throwaway line on the first listen. But then it sinks in, and you realize what a complex set of issues the line brings up. I love that kind of return in a song, and I love the level of writing ability it takes to deliver a line like that. Maxinne – under-rated beautiful love song.